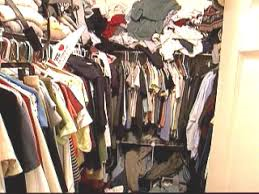 The Importance of Earnest Service » Blog Archive » Service of Closets: Why Do They Fill Up So Fast No Matter What? This entry was posted on Monday, February 4th, 2019 at 10:53 am	and is filed under Closets, Moving	. You can follow any responses to this entry through the RSS 2.0 feed. You can leave a response, or trackback from your own site. Excellent observations as to why closets and bureau drawers fill up so fast. I’ve read you should toss one thing if you buy one thing which I have never thought to do. The closets always seem full because aren’t we just getting rid of stuff to make room to put more stuff away? 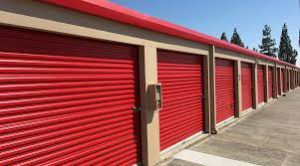 As someone with a lot of closet space and who also has two off-site storage units, I keep trying to get rid of things to pare down the off-site storage. Alas, it doesn’t seem to be working…but I do keep at it. Do you regularly access things in off-site storage–such as at the change of seasons to retrieve summer or winter clothing? Each time I move I think THIS IS IT. I can’t possibly pare things down further yet I do…to no avail hence this post. What has saddened me most in the past is the loss of literally thousands of books. Now I fear for the life of photo albums. I wonder if our mattress would be too bumpy if we slept on them…The space under the bed is spoken for. I fully agree with your observations about accumulation and the inexplicable futility of trying to minimize clutter. I also am in complete sympathy with you. Unfortunately, i am not sure how to understand or explain the problem unless it is totally a matter of personality and temperament. I have only superficial knowledge about Marie Kondo’s book and was a little intimidated when I first started to read it for guidance. I do know that my mother tended to hoard and my father was orderly, incredibly neat and organized. I can’t attribute it to their having lived wither with extraordinary largesse or being deprived. It seemed to just reflect their personalities and temperaments. At present or rather it seems for the longest time I am drowning in possessions, whether clothes, furniture, books and papers or minutae. I am working as diligently as I can manage in terms of time, physical, and emotional stamina to reduce everything. I try to direct as much a possible purpose- fully or usefully.Furthermore I do not have a large apartment! Although not religious I do think about St. Jude as a possible source of support. I believe he helps those who consider themselves or their problems lost causes. I do change clothes seasonally, but I also have some furniture that I store. I was able to move to the smallest space off-site when I got rid of my late husband’s wardrobe (extensive!) and my business attire. Photos are a recurring problem…I find them hard to throw out, even the ones of long-dead relatives that no one is around to identify any longer. I always feel as if I’m throwing away part of my past. Any unwanted books go down to our co-op’s library. Debbie wrote on Facebook: Musical chairs with “stuff”. As Marie Kondo asks us to do: look at the items we are holding onto and ask “if it sparks joy?” Or what it usually evokes are memories. True. “I wore this to thus and such” or “I was working at this place when” or “Aunt X gave this to me” etc. I could write a book about acquiring “stuff“. I have many theories on how it happens including: necessity, as in appropriate clothes to go in the corporate world, because I like it and I need to have it, I inherited it and therefore must keep it or it was on sale! Having gone through numerous incantations of moving stuff around, donating, editing, etc. I have found two solutions; not perfect but workable: yes to Storage Unit’s! Or build a shelf and it will stay. When I moved into my newest apartment I hired the “closet lady “who did an amazing job of helping me organize. Every year I have called her to order extra shelf space which I am happy to report our all chock-full of stuff. I never want to be the kind of person that hangs clothing one way when it’s worn the other way when it hasn’t been, therefore creating the reason to recycle. I’ll always find room for the one I love! As you can tell I’m a veteran of stuff that is never ending. My philosophy is deal with it! LOL! My temperament is to hold on to things but the reality of my life has forced me to get rid of a lot. Had I still been living at one of my first NYC apartments it would have allowed me to indulge but that isn’t the case. While my office often looks as though a hurricane has passed through I like my home to be neat. I don’t like leaving in the morning with stuff all over the place. One of the things I’m trying to do before this move–but won’t have time to complete before packers arrive on Wednesday–is to place in large Ziploc baggies like things–all coasters in this one; all cocktail napkins in that one; all tights in those; all socks in others etc. I hope that the unpacking will be easier that way instead of sifting through boxes of stuff that landed helter skelter. My philosophy is out of sight out of mind so storage–except at the dry cleaner–is out of the question for me. Clearly I’m in the minority. I can’t IMAGINE doing that with clothes…putting it in one or the other direction to indicate what I’ve worn recently but then I don’t work in the corporate world. Nevertheless if a person can’t remember THAT God help them. I tend to wear things again and again being too lazy to dig around in the closet. I have fat and thin days which direct which slacks I feel like wearing. And once in a while I do what Harriet Schoenthal recommended: I shop in my closet. Amazing what I find! Just a word of caution: do not leave many things for extended periods of time sealed in plastic bags even from the cleaners.Two months over summer with some form of moth prevention should be all right. Fabrics, and leathers will discolor if slealed for long in plastic. Photographs and other papers should ideally be kept in acid free gas. There are companies that sell Crystal Clear Sleeves and Storage Bags for Photos, Art, Paintings, Pictures. Amazon lists them as does Gaylored Archival. Be particularly careful of storing delicate or evening wear. There are companies that sell cloth clothes bags for storage also. Squeamish me was also thinking of strange hands all over my clothes–and once I scoop out the plastic bags from boxes I assume I’ll toss the contents in appropriate drawers. Now that you warned me I will be sure to do so. I kept the plastic bag initiative for small things like napkin rings. I don’t think paper cocktail napkins will suffer as they are already covered in some kind of paper. Socks and underwear are safe. I didn’t know you shouldn’t keep clothes in dry cleaner bags. Yikes. 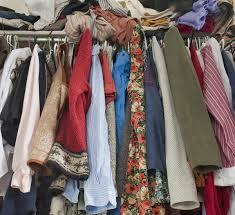 Edward wrote on Facebook: Major renovation problem with houses pre-1970s, closets were made for maybe 10 hangers, tops. The 1980s and up we became the disposable society, with giant walk in closets that can accommodate hundreds of clothes and dozens upon dozens of shoes we wear only once.